Bourbon, neat if you please. From the moment Katrina steps on stage till the final bow and exit, you believe you are watching P!nk. Katrina’s ability to embody the look, the attitude, the personality, and most importantly, the voice of this singular pop superstar has to be seen to be believed. She continues to amaze audiences wherever Raise your Glass (RYG) plays. Expectations of RYG being just another tribute band experience are quickly smashed and replaced by a deja-vu sensation that you are watching the real deal when Katrina takes the mic in hand. 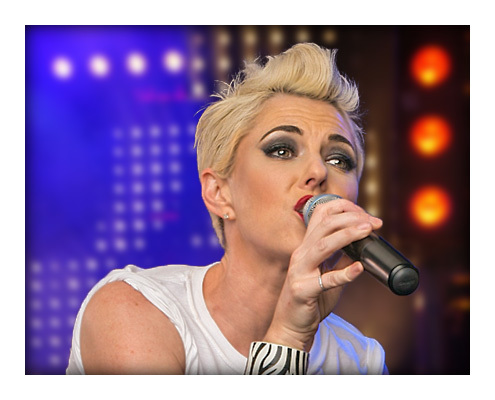 A natural-born musician and performer since the age of five, Katrina has always felt most at home on stage, where she can share her passion for music and entertaining with an audience, no matter how large or small the venue might be. Even the most jaded club goer is quickly won over by Katrina’s infectious joy in sharing her craft. Her ability to unify a crowd of strangers into a group of friends who all just want to share in having a good time is the lightning in a bottle that every club owner, entertainment buyer or talent agents hopes they can find, and Katrina delivers this in spades – every show, every time. Katrina began her musical odyssey when discovered the piano in her home – from age five she couldn’t keep her hands off it. In fact, banishing her from the piano was one of the only effective disciplinary tools they had for young Katrina when she was naughty, a trait she still has in common with P!nk. Piano was soon followed by the trombone, trumpet, euphonium and other brass instruments, which she played in marching bands as well as Jazz and Dixieland ensembles through elementary, high school and on through college. It wasn’t until college that Katrina found her “voice,” when in college she was asked to join a jazz group. That experience took her love for music and entertaining and dialed it up to 11. While still in college, Katrina performed in many acapella and choral groups before graduating and moving onto performing professionally. At that time, Katrina lived in the San Francisco Bay area, where she discovered she had a unique talent for not only performing but embodying the iconic music of superstar legends like Grace Slick, Madonna, Cyndi Lauper, Michelle Phillips, Joan Jett, Chrissie Hynde and many others. Katrina also developed a love for singing the classic songs of early female jazz pioneers like Ella Fitzgerald, Sarah Vaughan, Peggy Lee and Patsy Cline, to name a few. 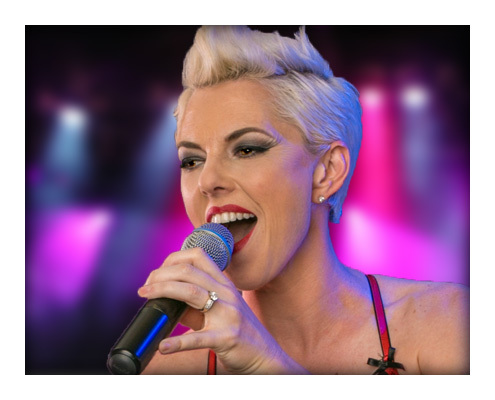 When Katrina moved to Los Angeles in 2013, she quickly established herself as a leading voice behind many popular tribute and cover groups. As a revival of interest in 80’s music generated high demand, Katrina fronted several successful groups such as Radical 80’s, the 80’s Invasion and Party Bot. Most notably was Katrina’s picture perfect portrayal of Pat Benatar in the Fire ‘N’ Ice tribute band. In Raise Your Glass, though, Katrina has really hit her stride. Audiences everywhere are amazed at her ability to bring the P!nk experience form the arena into a show room without losing any of the energy or the “we’re all in this party together” feeling that is the signature of a P!nk show. Raise Your Glass is the real deal, and Katrina is the reason why.